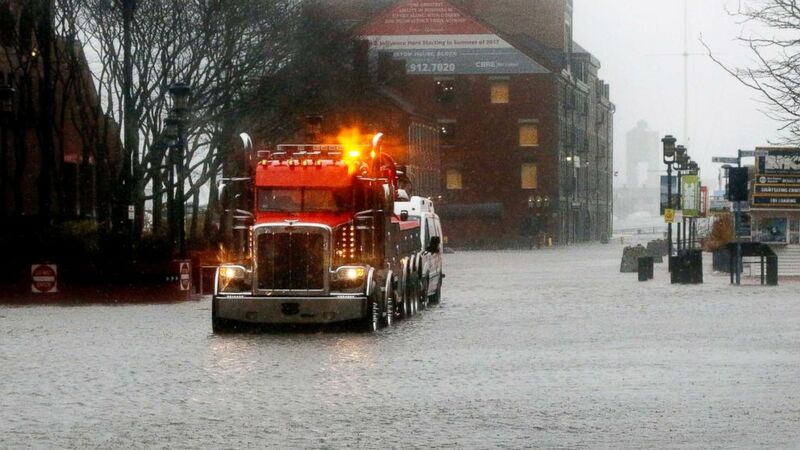 Images out of Boston already show dramatic flooding in areas near the harbor. Boston Harbor saw historic flooding as a nor’easter that pounded the East Coast coincided with high tide on Friday. The current record at Boston Harbor was just set in January at 15.16 feet. Friday morning's high tide fell just short of that, peaking at 14.67 feet, for the city's third-highest flooding on record, according to the National Weather Service. Officials feared the high tide before midnight, late Friday, could set an all-time record, but it wasn't quite as bad as predicted. The high tide peaked at 13.83 feet, with a 2.9-foot storm surge, according to the NWS. Images out of Boston on Friday afternoon showed dramatic flooding from the harbor into the Seaport district and other nearby areas. The storm strengthened rapidly Friday, undergoing what's known as bombogenesis or "bombing out," when a low-pressure system drops 24 millibars in 24 hours. Dubbed a "bomb cyclone," the catchphrase was coined earlier this year as a nickname for another nor’easter back in early January. The flooding in Massachusetts prompted local emergency services to warn residents against attempting to drive through the waters. (Bill Sikes/AP) A wrecker tows a vehicle stranded on State Street by water from Boston Harbor at high tide, March 2, 2018, in Boston. Marshfield resident Joe Rossi posted a video on Facebook to show massive waves crashing over the sea barrier from the third floor of a building he was standing in. "These waves are clearly going over this building," Rossi said, showing the building to his left. The nor’easter is so strong that it toppled a near-empty school bus over in Pennsylvania, injuring the driver.